It’s hard to believe that it has been over 20 years since that evening of March 28, 1992 when Duke played Kentucky at the Spectrum in Philadelphia in the finals of the NCAA East Regionals that would send the winner to the Final Four. I was fortunate enough to have been in attendance that night and it is easily the greatest sporting event that I have ever attended. With Duke trailing 103-102 following an unbelievable shot by Kentucky’s Sean Woods with just 2.1 seconds remaining in overtime of what had already been a fantastic basketball game, it appeared that Kentucky was on its way to the Final Four. Unfortunately for the Wildcats, Duke’s Grant Hill and Christian Laettner had other plans. Following a time-out, Hill took the ball out of bounds under his own basket and made a perfect length of the court pass to Laettner who, with his back to the basket at the foul line, caught the pass, took one dribble, turned and put up a shot as the buzzer sounded. The ball hung in the air then dropped through the hoop as the buzzer rang triggering a joyous explosion of Duke players and tears and disbelief for the heartbroken Kentucky squad. Duke went on to win the 1992 NCAA Championship. I have seen replays of the shot well over 200 times and it never gets old. It was an incredible performance, not only by Christian Laettner, who was 10 for 10 from the field and 10 for 10 from the foul line in what was for him, a perfect performance, but from both teams who battled each other the entire game. It was unquestionably the greatest college game ever played. As great as that game was, I still wondered how author, Gene Wojciechowski, would manage to fill an entire 300 page book with the details of a single game. As it turns out, he doesn’t. The Last Great Game chronicles the basketball program at both schools and how Kentucky coach, Rick Pitino, had brought the Wildcats back from NCAA sanctions that had crippled the team. Duke coach, Mike Krzyzewski, had a talented team led by point guard Bobby Hurley, Hill, Laettner and others. They were the defending National Champions and strong favorites to repeat. 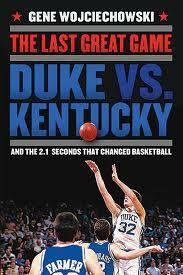 The Last Great Game isn’t a book for everyone but if you enjoy college basketball and like to read stories that emphasis just how great sports can be, then The Last Great Game is must reading for you. I give it **** stars.